I’ve been reminded recently of a simple truth about entrepreneurship: It tends to make one pretty uncomfortable, at least at the start. Don’t get me wrong: Launching your own business can and should be fun. It should be exciting and rewarding. But at the end of the day, you’re leaving a career you’re pretty proficient in—a career in which you’re an authority—for the unknown, for a world in which you’ll have to learn new things and take new risks daily. That can’t help but make you feel uncomfortable. My spouse recently left her legal career, a career in which she was quite successful, to go out on her own entrepreneurial limb. I’ve watched as she’s tried to come to terms with the fact that her daily activities are no longer all within her wheelhouse; she is, on a pretty regular basis, uncomfortable with what she has do to. For that matter: at an investment property I own, I recently found myself spending a whole morning trying to change some bathroom fixtures to get one of the properties ready for new tenants. It was a frustrating and inefficient morning, as I am not even close to being a gifted plumber—but it was a good reminder that, when you launch your own business, you have to do things you’re not super comfortable with. Being uncomfortable is, I think, the cost of doing business. It’s the price you pay for challenging yourself, forcing yourself to grow. 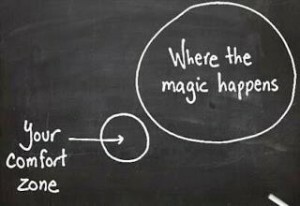 And without some discomfort, you’re simply never going to achieve your goals. But keep going. I know this will sound cliché, but it happens to be true: Things get easier. You become more comfortable as an entrepreneur over time. You learn, you grow, and you become proficient in a whole new set of skills.